Aspyn Ovard is a lifestyle box for young women with items selected by YouTube extraordinaire Aspyn Ovard. If you don’t know who Aspyn Ovard is just type her name into YouTube and be amazed at the amount of videos she has posted to her channel! 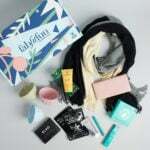 Aspyn offers two box options: My Subscription Box for $15 every other month and her VIA (Very Important Aspynista) box for $49 every other month. This review is for the VIA box. Check out the Women’s Lifestyle Box Directory and make sure to add Aspyn Ovard to your subscription list or wishlist! YumEarth Sour Beans (4 oz.) – $6? I can’t find this same size package online for sale so I’m making a guesstimate for the value. These are delicious! I love that they’re not made with artificial dyes. Tangy, sweet and chewy what’s not to love? Mini Candle – value $2? This candle was too overpowering for me. The scent is listed as freesia and pear on the info card. It was all I smelled when I opened the box. Aspyn’s suggestions for party songs. Aspyn’s recipe for creamy cauliflower alfredo sauce. Wow! What an interesting and unique addition to a subscription box. I’ve never even heard of these before. I guess they are like “lifts” for women. The canister comes with two foam-like wedges to slip into your shoes. I tried using them with two different pairs of shoes and they didn’t work for me so far. My heel kept slipping out of both pairs. Maybe they will work better with boots. These midi rings are too big for my thin fingers so they fit better as regular rings. They don’t appear well made and look like something you could get very cheaply at a flea market. Not a fan of the foil packet samples in boxes especially at this price point. Weleda is a great brand though. I’ve received this mascara in other beauty boxes and I’m not a fan of this particular formula and brush. I’ll pass this along to a friend. I love this eye pencil by Pixie! There is a matte side and a shimmery side. I use the matte side for my waterline and the shimmer side for the inner corners of my eyes and under my brow bones. Unfortunately this Mai Tai color is too orangey for my eyes. I’m planning on trying it as a blush though…I’ve received these eyeshadow pans before and since I don’t have the palettes in which to store them I find them pretty worthless. Does anyone have any suggestions on how you store the pans if you don’t have a palette? The eye shadow and Pixie eye pencil are both swatched here (matte and shimmer). Wild and Free Shirt (Aspyn Ovard exclusive) – $18? When you sign up for the Aspyn Ovard box they ask for your clothing size. This white short-sleeve t-shirt is so cute. There is no tag inside with a size or fabric composition. It’s very soft and nice and long which is great for wearing with leggings. Loose paper straws with no packaging kind of skeeve me out so I won’t be drinking from these. Aspyn suggests hanging this bunting behind the dessert table at your next party. Some of the bun pins on the Kitsch website are so cute! This one with the chevron pattern in silver just looks very black and almost dirty. It’s not my style but I will pass it along to someone who likes it. Aspyn suggests making friendship bracelets at your party with the thread and including the enclosed infinity charm on one of them as well. These temporary tattoos are very cute, but I don’t think I can carry them off personally. I like the mixed silver, black and gold colors – great for summer! The rose pattern on these nail wraps is very cool. I don’t use nail wraps so these will be passed on to a friend. Verdict: Wow! This box sure was chock full of stuff! Aspyn Ovard is very young and so are most of her fans so I know this box isn’t geared towards a married mom pushing 40, but that being said I think it had great value. Many of these items will be passed on to our teenage babysitter who is a huge Aspyn Ovard fan and I think she will be so happy! I feel teens and women in their 20s would really enjoy this box. Many of the items have guesstimates on the value but I came up with a total of $126 which well exceeds the cost. Aspyn offers two different subscriptions. One is $15 and one is $49. I’ve been reviewing the $49 box. Hope this helps! ? This all seems really junky to me. I would be mad if I received this. Not crazy about everything in the box, but I love love LOVE those nail wraps. I look forward to seeing what future boxes hold. Make sure that you read the fine print VERY carefully on this sub. I signed up April 23. I tried to cancel for the following box (the first box took forever to get to me.). When I went to their site, it said to email them to cancel. I did that . I received an auto generated response that they would be in touch shortly (usually 3-4 business days. It said for enquiries (sic) in regards to subscription box cancellation, we will get back with you soon to confirm your request. Then I got an email stating that I had to call to cancel, but I could only call between 12-3 M-F EST. The email also stated that I could not cancel the June box. I would still be charged for it. She said that in order to cancel the June box, I had to call them by April 15th! Mind you, I didn’t even subscribe until April 23. I finally received my April box around the 20th of May. It was fine, but I’m really upset that I couldn’t cancel the June box. Supposedly I can’t cancel because these boxes are so customized, they were already working on my June box before I even ordered my April box! I bought an ArtBin Sewing box from JoAnn for $5 that has a magnetic bottom inside to store my pans. @ $10 & come in various shapes (lips, flower, purse) & then there are several larger sizes in more traditional rectangular shapes. For each respective size, depending on how much you customize, they cost the same or just a tad more than Z-palettes yet are so much better made. Two other vendors, MiniMint & anothersoul, make beautiful, albeit more traditional, palettes that are more similar in construction to z-palettes, though w/out the clear window (which has pros & cons); they are very well made & until GlamTech came on the scene I would have repurchased, as I do really like the palettes I have from both. In the end, though, they are constructed from cardboard & paper, so while mine have held up very well thus far, long-term they of course will not stand the test of time in the way acrylic will, & of course they cannot be washed. All of that said, if you don’t plan to use your palette a lot &/ or if you just really like one of their designs, I still would not hesitate to recommend them. Check them all out; I don’t think you would be sorry with a purchase from any of the three, and then your pans will finally have a home!! Melissa you rock! I had no idea there were so many options and would never have thought to look on Etsy. I will certainly check them out. Thank you!! ? The retail may add up, but it still seems like a pretty low value box. For $56, I think anyone most people would be happier with a FFF or a Popsugar + Popsugar Mini. But I guess for fans of whoever this girl is, it probably doesn’t make a difference how great a value this box is or is not. If one of my daughter’s favorite bloggers puts out a box, I know I’ll have to buy it whether it’s a good value or not.